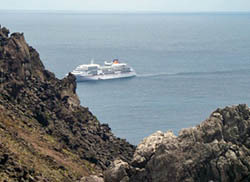 Reports of visits by cruise ships to Tristan da Cunha during the 2008 to 2009 seasons. MS Europa was fortunate to arrive during the best weather of the season so far. the ship landed the majority of her 291 passengers, who spent about 5 hours ashore, visiting the Post Office, Prince Philip Hall (where souvenirs were on sale), Museum and Albatross Pub. 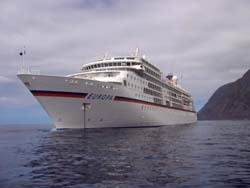 MS Europa is the flagship of the German Hapan-LLoyd group and can carry 408 passengers, solely in suites. The Berlitz Cruise Guide awarded the ship 5* plus for the 8th consecutive year for 2009 - the only ship in this highest category. The ship had its maiden voyage in 1999, has 264 crew, a cruising speed of 21 knots and is 28,600 tonnes gross. The ship was en route from Cape Town to Buenos Aires. We are in touch with the ship as its continues its cruise and hope to have additional pictures and report on the Tristan visit here soon. all of us to visit your island'. SV Europa made a two day visit arriving on 5th April 2008. 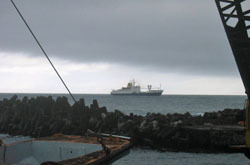 Fine weather enabled the vessel to remain overnight at the anchorage. This regular visitor did a circumnavigation of Gough on 25th March, unfortunately a Tristan landfall was prevented by a swell as the ship continued to St Helena, & then Ascension. The cruise liner MV National Geographic Endeavour arrived on Saturday 22nd March, picking up Tristan guides for an afternoon on Nightingale, and landing passengers ashore on Tristan on Easter Sunday 23rd March. 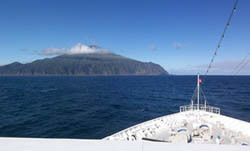 The ship continued to St Helena and Ascension Island. Endeavour was photographed by David Morley from The Residency garden with RFA Lyme Bay to the east. She carried 40+ students who study on board as well as help sail the ship. 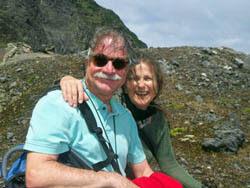 They are on an 8-month cruise around the world. They presented Chief Islander Conrad Glass with a plaque and David Morley presented them with some books. Next year they hope to return and hope to stay ashore overnight. Left: Photo. of SV Concordia with the RFA Lyme Bay beyond from David Morley. Cruise ship MV Corinthian II called en route for Cape Town on Saturday 15th March, but couldn't land anyone due to the swell. Nevertheless locum Dr Lazlo (who had covered for Dr Carel Van de Merwe during his leave) managed to get aboard and is now en route to the UK where he will take up his next post in Scotland. SV Europa arrived on 7th April, but wet & windy weather over the holiday weekend with blustery westerlies meant too much swell to use the harbour or anchorage. But the weather moderated on Easter Monday and the Europa, which had been sheltering off Halfway beach near Sandy Point since arriving on Saturday, came round to the anchorage on Sunday evening and put passengers ashore on Monday morning. Europa has 34 passengers & 15 crew, and is the last of three scheduled 2007 cruise ship visits. Photograph of Europa setting sail to leave Tristan on 9th April from Thierry Assef. See also news and picture on Shipping News Page. 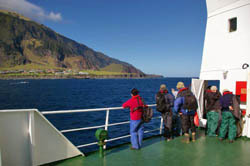 The cruise ship Professor Molchanov (Master: Engeny Baturkin) - a regular visitor to Tristan waters - arrived at Tristan at 0845 on Thursday 22 March, having sailed overnight from Gough Island where passengers had spent the previous day in good weather circumnavigating close offshore to view the birds and wildlife there. Photographs from Thierry Assef and news from Thierry and Mike Hentley. Left and above : The cruise ship arriving at the Tristan anchorage on 22nd March. Passengers on Professor Molchanov eagerly await disembarkation to visit the Tristan da Cunha Settlement of Edinburgh of the Seven Seas . 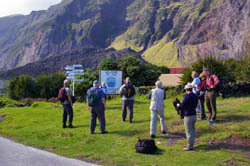 The good weather held on Thursday 22nd when the 43 passengers and 9 staff spent the day ashore, and are seen left at Tristan's famous sign indicating that they have landed on the world's most remote settlement. A bit of a blustery wind from the North East on Friday 23rd March, and a lot of swell at the harbour, so the ship sailed over to Nightingale. 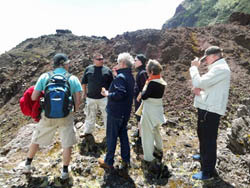 Fortunately a group of Islanders were already on Nightingale to act as local guides for the passengers. The ship returned to Tristan on Friday night . MS Endeavour sailed from Ushuaia on the Argentinean side of Tierra del Fuego on 4th March and travelled via the Falklands and South Georgia, then cruised for 5 days to Tristan da Cunha. Originally scheduled to arrive on 18th March, the cruise ship was delayed by 'Roaring 40s' weather, sailing around the edge of a storm which had lashed Tristan over the weekend with heavy rains and wind gusts in excess of 40 knots. Winds and seas had moderated by 0730 on the Monday morning, enabling Inspector Connie Glass and his immigration team to go aboard and stamp passports before the first of the passengers disembarked in the ship's fleet of zodiac ferry craft. Among the 90 passengers and 82 crew was Mgr Michael McPartland, Prefect Apostolic of the South Atlantic, who had joined the Endeavour during her call at the Falklands in order to visit the community on Tristan where he is now staying until the end of April. This was the ship's first visit to Tristan using her 'National Geographic' title, as she had simply been the MV 'Endeavour' during her last call in 2004. To mark the occasion, ship's captain Oliver Kruess presented Administrator Mike Hentley with a ship's plaque at a reception held on the Residency lawn. Guests then rejoined the ship at midday accompanied by local guides to circumnavigate Nightingale & Inaccessible Islands, before returning to Tristan in the evening to land the guides and continue the cruise. Although minus one passenger, the ship's stores were augmented by some freshly-caught Tristan rock lobster, plus several loads of locally-grown potatoes destined for friends and relatives on St Helena. 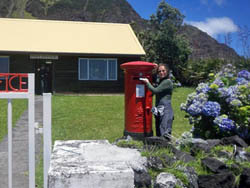 Ms National Geographic continued with a 5 day cruise to St Helena, then on to Ascension Island, Cape Verde Islands and finishing in Las Palmas in the Canary Islands on 7th April. 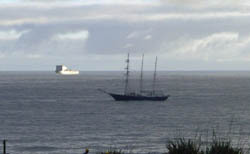 Photograph of the MS National Geographic Endeavour at anchor off Tristan da Cunha from Thierry Assef. Cruise passengers enjoyed a special Reception on the lawns of the Residency as part of their visit to Edinburgh of the Seven Seas on Monday 19th March. Photograph from Thierry Assef. A dozen islanders joined the vessel, to help in the trip to Nightingale and to guide the visitors ashore. Tristanian women were also on board promoting the island handicrafts and products. The weather was good enough to permit landing by zodiac for those fit enough to clamber out on the steep rocky landing (see photograph left). Those who were not fit for this hard landing, had the opportunity to go around the island with Zodiacs, organized by the expedition team. The bird lovers had the opportunity to see some albatross on the hill and lots of rockhoppers, in front of the huts. 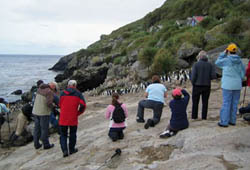 The photograph left shows a group of moulting Rockhoppers on their rocky Nightingale perch being photographed by cruise ship visitors. We had a wonderful way back, on a smooth sea with a sunset on Tristan Island. The cruise ship Professor Molchanov visited the Tristan group from 26 to 29 March, calling first at Gough and then spending the Monday-Wednesday around Tristan. 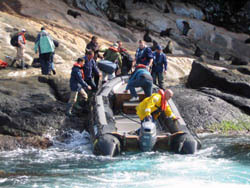 Initially poor weather conditions improved on the final day to enable most of the 51 passengers to land on the main Island, and subsequently on Nightingale too. The Alexander von Humboldt arrived for a half day visit on Saturday 18 March with 240 passengers. Sea conditions were good, and a number of passengers and crew were able to come ashore for the afternoon. Ten additional passengers joined her at Tristan for the passage to Cape Town. These included newly-weds Barry & Hazel Carter, who had visited Tristan to get married, Nola Evans (nee Swain) & family completing a visit here, and Tristanians Stanley & Jean Swain departing on well-earned leave. The MV Bremen (105 passengers), visited Tristan for the day on Friday 17 March, and is photographed departing to take passengers to Nightingale while the MV Alexey Maryshev (43 passengers) arrives for her two day visit. Good sea & weather conditions enabled everyone to come ashore, and 21 passengers from the Russian ship asked permission to stay on the Island overnight. MS Prinsendam II is photographed left visiting Tristan on 14 February as part of her round the world cruise. Calm sea conditions enabled a grand total of 340 passengers and crew to disembark and visit Tristan for a few hours during its brief stay. This is understood to be a record number of visitors ashore and more than doubled the island population! 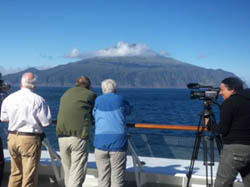 This cruise was organised by the Tristan da Cunha Association in collaboration with the Tristan da Cunha Government. 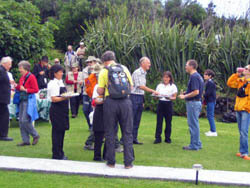 It allowed visitors to stay overnight for several days and provided a unique on-shore programme. It is hoped that similar cruises may be offered in the future. Check out the RMS St Helena Cruise Page for a full report. A record 291 passengers and 55 crew (more than doubling the population for the day) from the Hapag-Lloyd cruise ship enjoyed calm, sunny conditions for a 5 hour stay in the world's most remote settlement giving a fine start to the 2006 cruise ship season. < Left - MV Europa is photographed from sea with Big Point in the background. MV Europa visited Tristan en route from Cape Town to South Georgia. < Left Islanders enjoy a game of football on the American Fence field whilst waiting the arrival of MV Europa.